Glance around. 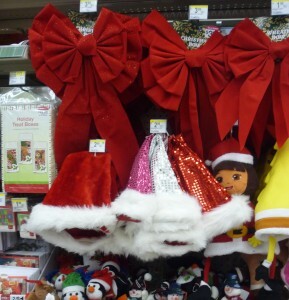 Do you see signs that the winter holiday is rapidly approaching? Because we sure do! The Christmas season is great — don’t get us wrong, we love the little lights, the carols, the glittery ornaments, that scent of fresh pine — but it’s great after Thanksgiving. Halloween was a matter of days ago and Turkey Day is still a few weeks away. We can’t start singing “Frosty the Snowman” until after the pumpkin pies have been demolished and the leftover turkey sandwiches finished! But take a little stroll down Telegraph Ave. and you’ll think that we’re days away from Santa’s annual visit. There’s a banner hanging above that vacant lot promoting a holiday street fair that doesn’t start until Dec. 16 (and we’re pretty sure that the banner has been up for at least a month)! Meanwhile, Walgreens is eager for the holiday rush to begin. They have their colored tinsel and plush dancing/singing Christmas tree atrocities on full display. 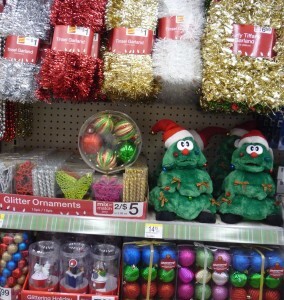 An abundance of red and green grace nearly every shelf — can no one wait until December? Ribbons and wreaths hang about and jolliness fills the air. C’mon, people! We’re not trying to be grinches, but please, won’t you save that Christmas cheer for later — we’re just trying to make it ’til Thanksgiving, here. Aw, this was a really nice post. In concept I would like to put in writing like this moreover – taking time and precise effort to make an excellent article… however what can I say… I procrastinate alot and certainly not seem to get something done.